The Deyin Instructor Annual General Meeting is an annual gathering to give Deyin Instructors a good opportunity to discuss and make suggestion on the future development of the Deyin Taijiquan Institute. 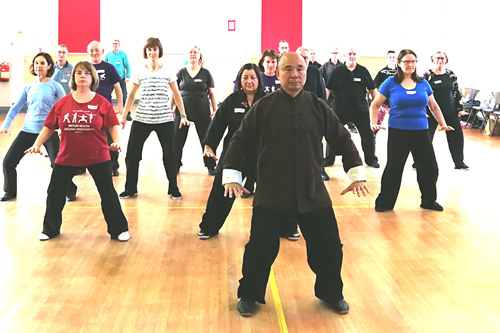 In the last twenty odd years, the Deyin Taijiquan Institute has grown from a small local organisation to an international entity with over 40 instructors throughout the UK and Europe. We invite all Deyin Instructors to join us to review our progress and development in the last year and hopefully together we can develope further strategy in making the Deyin family a truely global newtworking platform for all Tai Chi and Qigong enthusiasts. Other Deyin members who wish to attend as observers are most welcome. The Xing Yi Standing Pole Qigong was created by Professor Li Deyin's father, Qigong grand Master Li Tian Chi, based on the principle and essence of the internal martial art Xing Yi Quan.